As highlighted in my previous tutorial, the lessons are designed to help individuals pursuing knowledge for certification in VCP (VMware Certified Professional) and DCV (Data Center Virtualization), with a hands-on approach. You can always revisit the previous article where we learned how to install a Type-2 VM. As always, head over to the VMware website for more detailed information about software packages. One of the most crucial aspects of this set up requires hardware with minimum specifications to run the Type-1 hypervisor ESXi. ESXi 6.0 requires a host machine with at least two CPU cores. ■ESXi 6.0 supports 64-bit x86 processors released after September 2006. ESXi 6.0 requires the NX/XD bit to be enabled for the CPU in the BIOS. ESXi requires a minimum of 4GB of physical RAM. It is recommended to provide at least 8 GB of RAM to run virtual machines in typical production environments. One or more Gigabit or faster Ethernet controllers. For Serial ATA (SATA), a disk connected through supported SAS controllers or supported on-board SATA controllers. SATA disks will be considered remote, not local. This is where having an account with VMware comes in handy. After your account becomes active, browse to the download section to access lots of software for practice along with their licenses. Bearing in mind this is a type-1 Bare-Metal Hypervisor installation, you must have a working .iso file burned onto a disc or USB flash drive. Go into your system bios settings to enable VT-x functionality, set to boot from disc or USB flash and reboot your system. 1. If you got the initial set up right, you should see a loading screen as below with ESXi unpacking required components for installation. 2. Next you will be presented with some information about access to information about compatibility for your hardware. You can hit Enter to continue. This installation should take about 5 minutes to complete. 3. Read User License Agreement and hit F11 to Accept and Continue. 4. At this stage, set up will ask which drive to install ESXi on. The virtual drive already selected will be adequate so press Enter to continue. 5. Select the keyboard layout depending on your location and options presented. 6. This step is where you choose your root password. This is important and worth documenting, as you will need this password to log on to the ESXi host later in this lesson. The root password will also be required when making changes to your ESXi host as well as rebooting or shutting down the host hypervisor. You can hit F9 to go back to make any changes and you can manage your passwords after the installation is complete. 7. A warning prompt appears at this stage notifying a disk repartition, hit F11 to Install ESXi. 8. You will see the VMware ESXi 6.5.0 installation progress, provided no errors occur. 9. If you can see the screen below, your installation of ESXi was successful and you can now hit Enter to reboot the system. There is also a prompt to remove the installation media before rebooting. 10. During reboot, you will get to see some hardware information about the bare metal and version of ESXi that has just been installed. 11. Once the reboot is complete, you will notice a DHCP assigned IP address along with the option F2 to customize the hypervisor or F12 to Shut Down/Restart the machine. Now that we have our VMware ESXi system fully installed, there are a few configuration settings required to manage the host. Remember that in a traditional environment, the hypervisor will have no graphical interface like we are used to in Windows operating systems so your method of control would be through a remote client. Try accessing all these options for details on customizable configuration settings to suit your needs. For the scope of this lesson, we shall be focusing on Network Management Configuration. 12. Select Configure Management Network from the list and use your arrow keys to navigate down to IPV4 Configuration. Here you’ll see the DHCP assigned IPV4 address, subnet mask and default gateway for your VMware server. 13. Hit Enter to edit those details. It is best to assign a static IP address in the same subnet to your VMware ESXi host, making it easily accessible for control by the vSphere client. Use the Space bar to mark your selection and Enter to accept the changes to set a static IP address. The DNS and Custom DNS Suffixes can also be edited with yourdomainname.com if you have one. 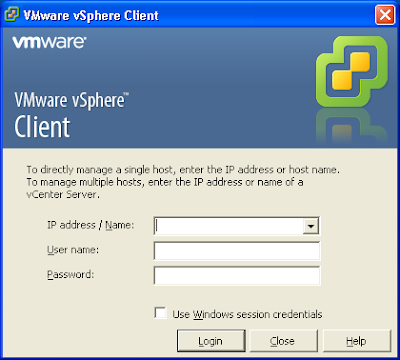 We are now ready to log into our Type-1 Hypervisor host and to do this, we’ll need a client application called vSphere which can be downloaded from the VMware website. Until recently, administrators needed to install the Windows Legacy vSphere client seen in the image below on another computer to be able to control the ESXi host. You can still access the host with this application by providing the IP address of the server, your root username and password. In this lesson however, we will be using the new web VMware ESXi client application to dial into and control our host. Click Continue after entering https://IPaddress of your server into a web browser. 14. You should see the log in screen below, go ahead and enter your root details to log onto the host. 15. If successful, you’ll see the main web client management interface for your ESXi host. Spend some time familiarising yourself with all the different sections available on this dashboard. We’ll take a closer look at all the management options and what we can further develop them in our next lesson when we learn to build multiple virtual machines inside an ESXi hypervisor host. Join us in the next lesson as we delve deeper into more advanced configurations of VMware ESXi to help sharpen your skills as you prepare for your exams or career as an engineer. Credits to all organisations and development teams at VMware Incorporated.